Created for | Tirmizi Campbell Inc. 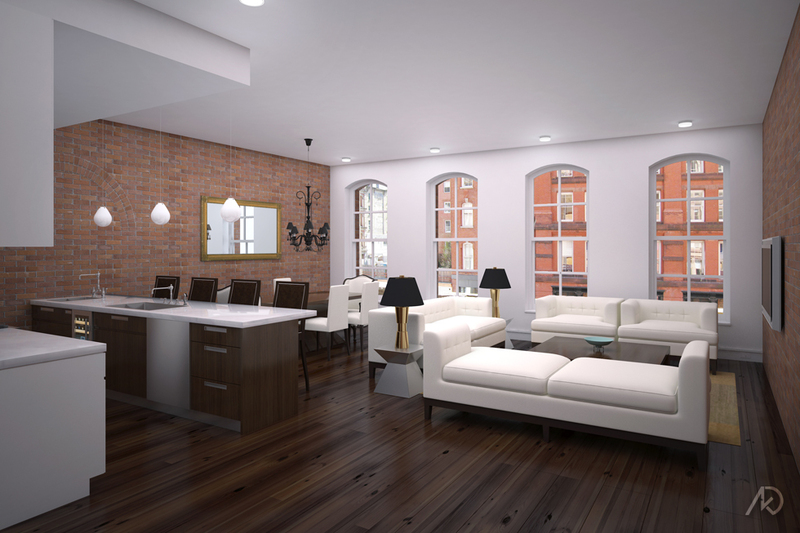 The following 3d illustrations were commissioned by Tirmizi Campbell Inc. for the purposes of marketing and selling their newly renovated apartments. 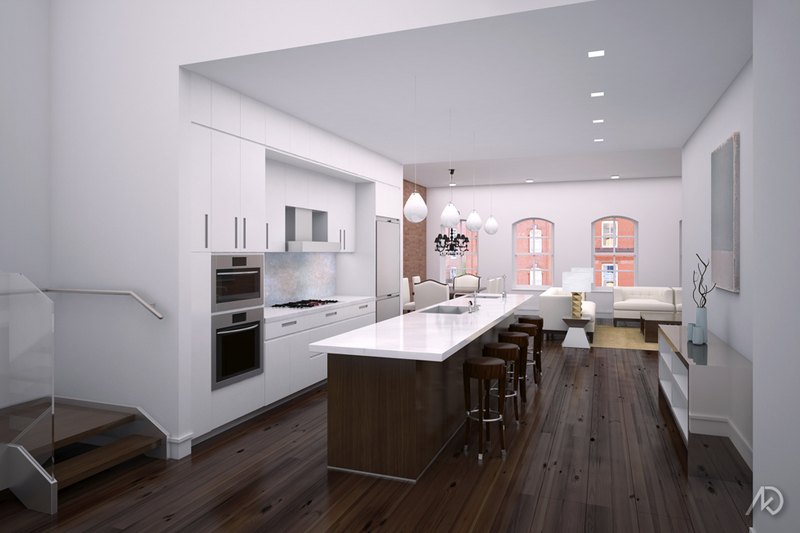 The small Tribeca building contains two apartment typologies – a typical unit and a penthouse . 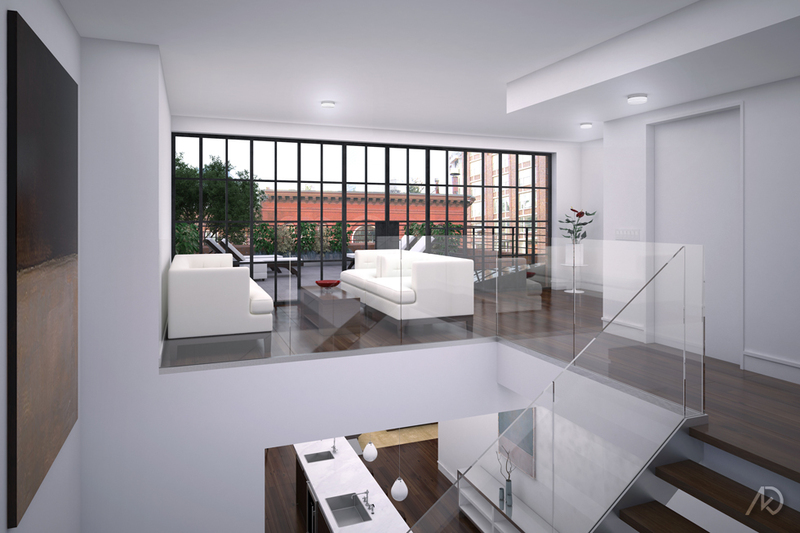 The typical unit is a single floor residence while the penthouse is a larger two-story unit. The illustrations show both the typical and penthouse typologies; focusing on the kitchen, living room, and bathroom. Each unit contains the usual high-end appliances and fixtures. Most items within the scenes were modeled by kk. All items in the scenes were textured and lit by kk. 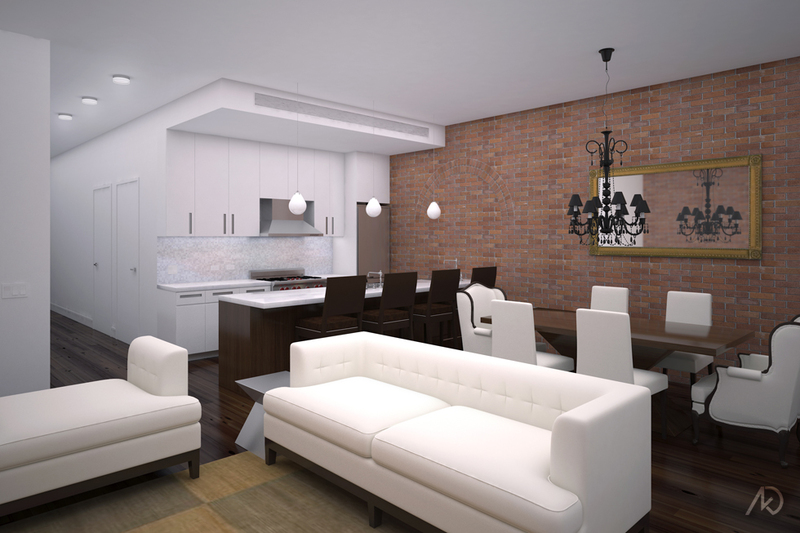 This view shows the kitchen of the penthouse unit. The stair to the left continues to the second floor living area and bedrooms. The large island contains a sink, prep-sink, dishwasher, and wine storage both below. The tile back-splash is an iridescent glass tile, which is consistent throughout the project. 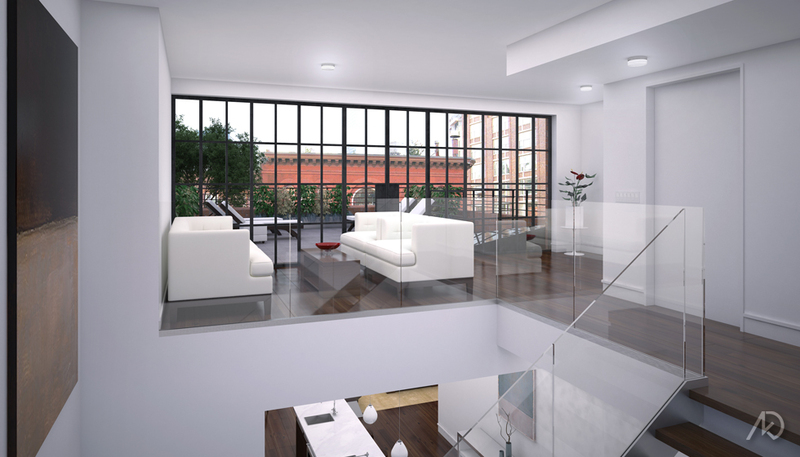 The view of the second floor living room shows the space and it’s relationship to the large outdoor terrace. One can see the kitchen below as well as the elevator to the right. Behind the camera, or to the far right, is the master bedroom and master bathroom. This view, taken from inside the walk-in shower, shows half of the master bathroom. 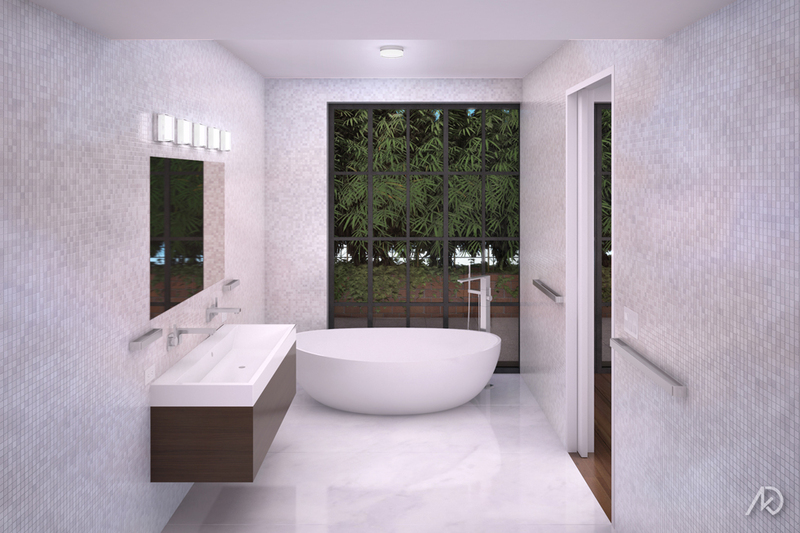 The master bathroom, and bedroom, have direct access to a smaller terrace. The terrace provides some privacy with a row of bamboo. The entire master bathroom is tiled in the iridescent glass tile. This 3d illustration shows the living room of the typical units. The living room is directly off the kitchen, and dining area. From this view one can see the back of the kitchen island which holds the dishwasher and wine cooler. Behind the camera, or the the far left, is the bedrooms and bathroom. This view shows the kitchen of the typical units. There are similar high-end fixtures as in the penthouse as well as a two sink island. The island/bar has room for four stools, sink, and a prep sink. To the right of the view one can see the dining area. The hallway leads to the bedrooms and bathroom.